It's official. Heavy metal band Metallica is bringing their "WorldWired" tour to the Denny Sanford Premier Center on September 11. The concert announcement came Monday after much speculation due to a video teaser posted Friday afternoon and throughout the weekend on social media by the Premier Center and the band. Tickets for the show are $65 and $135 and go on sale Friday at 10 a.m. at the Premier Center box office, ticketmaster.com, LiveNation.com, via the Live Nation app, or by phone at 800-745-3000. Metallica last performed in Sioux Falls at the arena in 1992. The announcement caps off a big week for the Premier Center, with tickets for rock band Imagine Dragons going on sale the next day. The band, formed in 1981 in Los Angeles, is considered one of the founding "big four" bands of thrash metal, and has sold over 125 million records worldwide. Metallica's greatest hits include "Enter Sandman," "Master of Puppets" and "One." 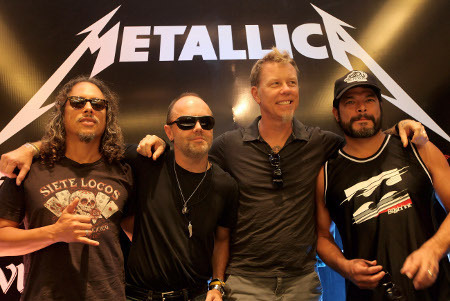 In their long and productive career, Metallica has won nine Grammy Awards from 23 nominations, and its last six studio albums have consecutively debuted at number one on the Billboard 200. Every Metallica ticket purchased includes your choice of a standard physical or standard digital copy of the band's 10th album "Hardwired…To Self-Destruct." Fans will receive info via e-mail after the tickets purchased on how to obtain a copy. Each concert on the tour will get rolling with the Light It Up pre-show party hosted by band friend Jim Breuer. Breuer hits the stage before the band with comedy, fan interaction, giveaways and much more.